Insider Deals is yet another adware program that you must remove if it is found active on your operating system. 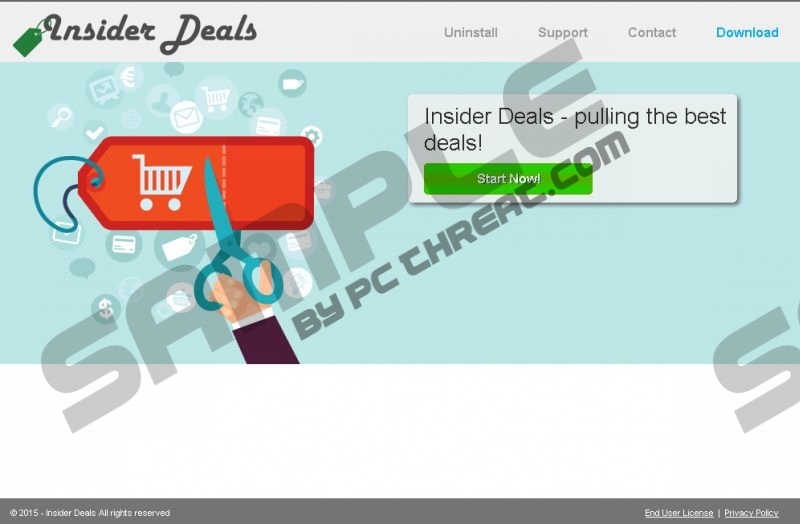 Like many other adware programs of today, Insider Deals is advertised as an excellent tool, which should be used to save time and money while shopping online. Unfortunately, the statements on its official website are not entirely true, as discount deals and coupons presented by Insider Deals are worthless and annoying to say the least. You can stop the annoying activity by conducting a complete removal of Insider Deals from your operating system. Use the removal guide that we provide below to delete Insider Deals in a smooth and timely manner. Since it is impossible to download Insider Deals from its official website because the direct download link does not work, it is not surprising that it is distributed in other quite questionable ways. The most popular way to distribute adware is via bundled installers. Install a professional antimalware tool in order to avoid various suspicious installers as it would warn you about them before the download starts. In most cases, such installers are obtained from questionable third-party download websites. If you practice safe browsing habits by avoiding suspicious download websites along an active malware detection and removal tool, you will make your system virtually unbreakable. The major indication that Insider Deals is active on your PC is a browser full of various third-party commercial ads and annoying pop-ups. This annoying activity will be a constant while you are browsing the web whether you like it or not. All the presented ads are utterly worthless and will not help you improve your online shopping experience whatsoever. Insider Deals also tracks your browsing habits. This program gathers information such as your geographical location, favorite websites, time spent on them. All of this information is later used to customize ads according to your needs. Thus, you might come across ads that could seem tempting.We advise you not to click on anything as so of ads could be implemented with redirect links, so you could end up on suspicious third-party websites set up by cyber crooks. Some websites that you might be redirected to could be fake online shops or websites that promote malware. Both instances are dangerous; to say the least, this is why the removal of Insider Deals is of paramount importance. Use the removal guide provided below to delete this intrusive adware program once and for all. Make sure to follow the removal guide with your utmost attention as just one mistake could mean that Insider Deals was not removed entirely. If you want to be sure that the adware program was removed completely, please use a professional antimalware tool for all removal purposes. Select Insider Deals and then click the Uninstall button. Select Insider Deals and click Remove. Move the mouse cursor to the lower-left corner of the screen. Right-click Insider Deals and select Uninstall. Quick & tested solution for Insider Deals removal.